USA's Nathan Chen performs to Peter and the Wolf at the 2010 AT&T U.S. National Figure Skating Championships. In sport, a young life can change at the drop of a hat. A winning touchdown pass can propel a quarterback from obscurity into the mainstream. An unexpected Olympic gold medal can transform an also-ran into an overnight sensation. We all love a good story of unexpected victory. USA’s Nathan Chen, an eleven year-old sixth grader from Salt Lake City, Utah, is one such story. At the 2010 U.S. 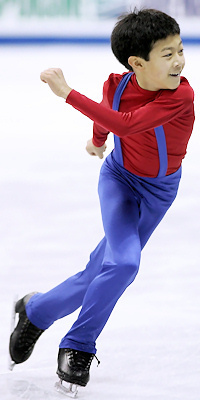 Figure Skating Championships, Chen qualified to skate in the novice men’s division – as a ten year-old. Competing against skaters who were as much as eight years older than him, Chen snatched the national title with steady performances that showed glimpses of brilliance. At just four feet five inches tall, Chen drew incited adoring giggles of ‘Isn’t he cute’ from the stands, but soon proved that he was more than just a little boy skating to Peter and the Wolf. Chen was a serious contender whose resume included the 2009 Intermediate Men’s silver medal and the 2008 Juvenile Boy’s bronze medal. Since winning the title in Spokane, Wash., Chen has experienced more opportunity than most skaters achieve in their entire careers. To start, as a national champion Chen was invited to perform in the Exhibition of Champions, which brought him to the attention of David Liu, an artistic director of the skating show “Wi Wa”. Chen isn’t eligible for Junior Grand Prix events until the 2012-13 season, so the decision allows the champion the opportunity to grow outside of the glare of high stakes events. The novice champion has entered several non-qualifying club competitions this summer, and recently competed and won the Glacier Falls Summer Classic in Anaheim. His total score of 124.53 points was more than twelve points higher than the second place finisher in the event. Chen’s next event will be Skate San Francisco at the end of the month. Chen attends Hawthorne Elementary School in Salt Lake City, and will be in the sixth grade in the fall. As a part of the Extended Learning Program, Chen takes classes one level above his grade level. Outside of the rink, gymnastics, and piano lessons, Chen doesn’t have much free time, but he dreams big both in terms of his skating and with regards to his skating afterlife. Other than his two brothers, Chen has two sisters – twenty year-old Alice is enrolled at Emory College and is a dancer. His nineteen year-old sister Janice is a student at Johns Hopkins University, and plays the violin and chess. Chen’s father Zhidong is a Research Scientist and his mother works as a Chinese interpreter.